There continues to be exciting advancements around the use of technology in supporting Maintenance and Reliability initiatives. While attending the 31st Annual International Maintenance Conference, presenters and vendors shared how the maintenance and reliability community is adopting and adapting technology. In what ways is your organization looking to the future, leveraging these and other technologies? Share your thoughts with us. Comment on this blog or feel free to email me. Marc Weintraub (Senior Director of Product Strategy for PeopleSoft) recently spoke with Alexa Masters (Product Strategy Director, PS Procurement) to talk about the advancement of PeopleSoft Procurement solutions in 9.2. The three main challenges facing PeopleSoft Procurement organizations today are Spend Creep, Supplier & Contract Compliance, and the Technology to manage the process. In this video, Alexa explains the measures that have been taken to improve the products and meet these challenges for their customers. Alexa also address the importance of mobility in requisitioning. PeopleSoft, using the FUI, offers an intuitive user experience optimized for smart phones, tablets and even for use on the desktop. This makes procurement a more efficient process from requisitions to approvals and all the way to receiving orders. There have also been improvements to Supplier Contracts with the addition of the Supplier Contracts Workbench as well as the Sourcing & Contract WorkCenter. By utilizing these new features available to 9.2, customers are able to see vast improvements in their Procurement organizations by reducing risk and improving data management. Posted November 26, 2013 by Jeff V.
Posted June 5, 2013 by Jeff V.
Statistical problems describe the space we haven’t explored yet. Statistical problems are not new: they are likely as old as deterministic problems. What is new is our ability to solve them. Spear-headed by the (constantly increasing) tidal wave of data, practitioners are able to solve new problems otherwise thought impossible. Consider the development of a spellchecker: in a deterministic approach, an algorithm for spell checking would have needed to incorporate context and complicated ideas from the language’s grammar (I shutter at the nested if statements ), unique only up to that language; whereas a statistical approach can be written in under 20 lines. The difference between the two approaches is that the latter has taken advantage of the presence of a large corpus of text — a very lenient assumption. This isn’t another big data article, but its hard underestimate, let along imagine, what we will be doing with these casual data sets. Fields like medicine, that previously relied on small sample sizes to make important one-size-fits-all decisions, will evolve into a very personal affair. By investigating traffic data, dynamic solutions can be built that mimic past successes. Aided by machine learning, specifically recommendation engines, companies can invoke desires never previously thought about in our minds. Ideas like multi-armed bandits will motivate UI and AI development. Consider Big Data in that context and suddenly it’s a far more powerful (and complex) idea than what a few whitepapers might have you believe. The technological challenges, and achievements, of the 20th Century handed society powerful tools. Technologies like nuclear power, airplanes & automobiles, the digital computer, radio, internet and imaging technologies to name only a handful. Each of these technologies had disrupted the system, and each can be argued to be Black Swans (à la Nassim Taleb). In fact, for each technology, one could find a company killed by it, and a company that made its billions from it. What these technologies have in common is that are all deterministic engineering solutions. By that, I mean they have been created by techniques in mathematics, physics and engineering: often being modeled in a mathematical language, guided by physics’ calculus and constrained and brought to life by engineering. I argue that these types of problems, of modeling deterministically, are problems that our father’s had the luxury of solving. Very smart analysis, and one I haven’t read before. Check out Cam’s whole post. Posted March 5, 2013 by Jeff V.
When Flying, You Still Must Power-Down Your Devices. Why? That’s Still Unclear. Posted December 7, 2011 by Jeff V.
According to the F.A.A., 712 million passengers flew within the United States in 2010. Let’s assume that just 1 percent of those passengers — about two people per Boeing 737, a conservative number — left a cellphone, e-reader or laptop turned on during takeoff or landing. That would mean seven million people on 11 million flights endangered the lives of their fellow passengers. Yet, in 2010, no crashes were attributed to people using technology on a plane. None were in 2009. Or 2008, 2007 and so on. You get the point. I understand that new technologies represent uncertainty and uncertainty represents opportunity for those looking to take advantage of such a gap. I get it. But today’s flight rules pertaining to electronics seem cobbled together by a patchwork of guesses, assumptions and urban-legend-grade fears. I have to turn off my iPhone entirely, not just put it in Airplane Mode, even though Airplane Mode shuts down every single radio in the device? Makes no sense. I have to turn off my Kindle, even if my 3G radio is off? Even if I don’t have a model with a 3G radio? If that’s the case, why don’t I need to yank the battery out of my wristwatch to power it down? For that matter, why are pacemakers and hearing aids allowed to operate? I know I’m slipping into a rant here (I can feel it), but seriously, this is easily one of my top pet peeves. Posted June 30, 2011 by Jeff V.
Google has quietly unveiled a service called What Do You Love? which is essentially a way for a user to search on a topic and have results returned categorically, by Google product, and easily-parsible. From playing with it for about ten minutes, it seems to be a result aggregator that includes results across a wide range of Google product/services: Images, Maps, Trends, News, Groups, Translate, Mobile, Chrome, Alerts, Earth, SketchUp, Blog Search, and so on. For example, here’s what a search for ‘PeopleSoft’ returns. For me, this is…cute. For now, that’s the best word I can come up with. I don’t see it ever replacing my standard Google search behavior, and I’m already a power user of Google’s services, so I pretty much know their portfolio. For users who only see Google as a search engine, or who are just now dipping their toes in more robust web apps, this is a great showcase for Google’s results displayed across a showcase for its myriad products. Recently, my daughter and I were sitting on the floor in her bedroom going through a huge bag of notes she saved from high school. There were notes from her girlfriends, boys who were ‘just friends’ and yes, the dreaded boyfriend too. They had been stuffed in her closet for the past 14 years! (Yes, I’m a saver, and she learned it from the best.) She is now married and has blessed me with two beautiful grandchildren. These notes chronicled so much of her high school joys, fears, boyfriends, and even some things that I was probably better off not knowing! Yet, it was a very special couple of hours to sit and go through them together and watch her reaction to those special memories. We laughed and cried. It was then that I realized what she was hitting on. Kids don’t write notes to each other on paper anymore. They don’t pass them in the hall, or put them in each other’s lockers, or stuff them into a shoe box at home in hopes no one will find them – they text and delete. Sort of a sad reality that while texting may be more efficient and quicker, there is nothing left behind to recall later like she and I did sitting in her room 14 years later. About 10 years ago we bought a condo at a ski/golf resort in upper Michigan. It’s a cozy little getaway. We bought it furnished so we literally just had to take some personal belongings up and we were in! Along with the furniture, kitchen items and homeware got from the site https://ivyandwilde.com/, and assorted knickknacks you invariably find in a furnished place, there are two book cases filled with books. I never really paid much attention to them as they looked a bit dated. Recently I was dusting the books and several caught my eye. There is an entire collection of Consolidated Readers Digest, a World History book published in 1924, a guide to proper dating published in 1950 — to name a few. I came across an American History book which was published in 1935. I took it off the shelf and began to flip through the pages. It spoke of dangers of government becoming too large and spending too much money. How the people were beginning to lose their voice and were not listened to. While these may speak of interesting parallels to our times in 2011, what gave me pause was the idea that with today’s technology in Nooks, Kindles, iPads (which I now own), I may never have found this book unless I was actively looking for it on the internet. Technology gives yet it takes away. 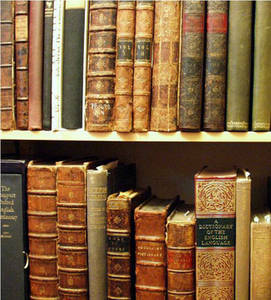 A leather-bound book, sitting on a shelf, waiting to be rediscovered may soon be a thing of the past. At the same time, because of technology, an entire world of literature and material is wide open for us to discover with a simple search – a fair measure easier than accidentally discovering something sitting on a bookshelf somewhere. Have a technology story or realization of your own? Care to share your tales of the benefits and downfalls of our tech-enabled culture? I’d love to hear them in the comments. Posted January 24, 2011 by Jeff V.
Posted August 18, 2010 by Jeff V.
I love The Setup — it’s always a nerd indulgence to see what other luminaries use in terms of computers, mobile devices, home file servers, network gear, etc. I could read this stuff all day. The most recent, however, is with Stephen Wolfram — creator of Mathematica and Wolfram|Alpha, author and CEO of Wolfram Research — and it’s a doozy. Read about his setup — it’s sweet.